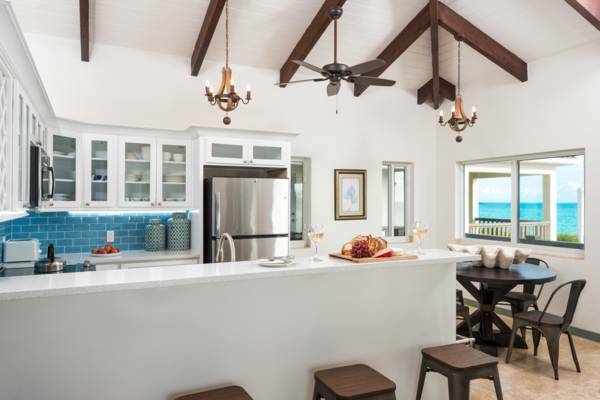 True to its name, Ocean Palms Villa offers a luxurious retreat tucked within a lush palm grove at the ocean’s edge. 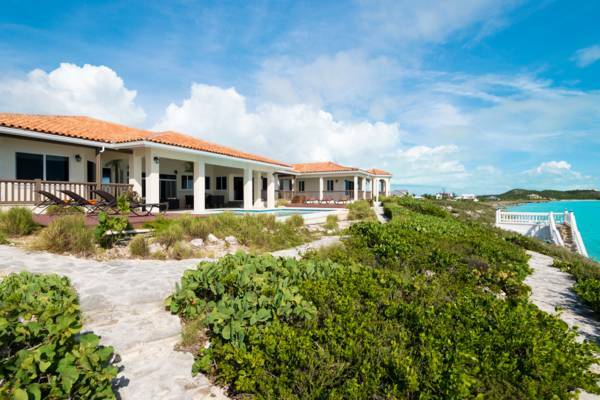 Located in Turtle Tail, on the southern coast of Providenciales, this 4-bedroom custom-built villa provides one acre of relaxed seclusion. 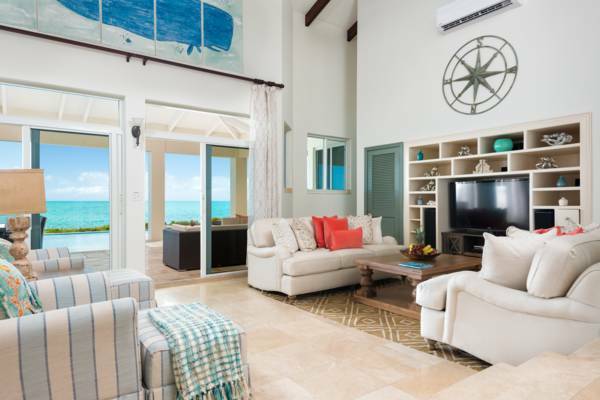 As you step inside the spacious living area, you’ll face a mesmerizing view of the ocean. Surrounding you is an inviting interior with comfortable furnishings and carefully selected décor, including mosaics by local artisans. 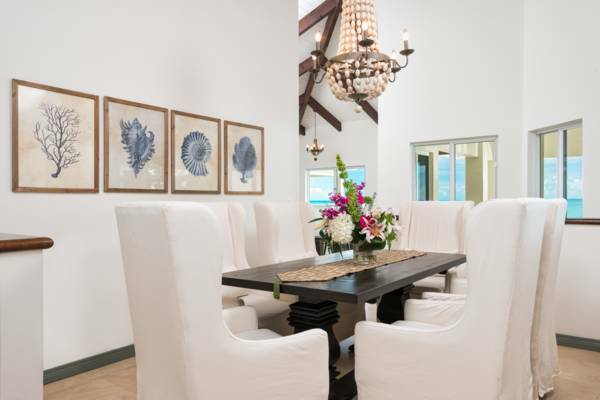 To the left is a fully equipped kitchen, breakfast table, and six-seat dining area with picture-window views. Slide open the large glass doors before you and you’ll instantly merge the indoor and outdoor living areas. There’s plenty of cushioned seating on the patio lounge, along with an alfresco dining area and outdoor grill. The scene is set for barbecuing up an amazing island dinner. The entry into your pool is under the patio and shaded from the tropical sun. It’s perfect for children or those just wanting to cool off their toes from the shady comfort of a lounge chair. 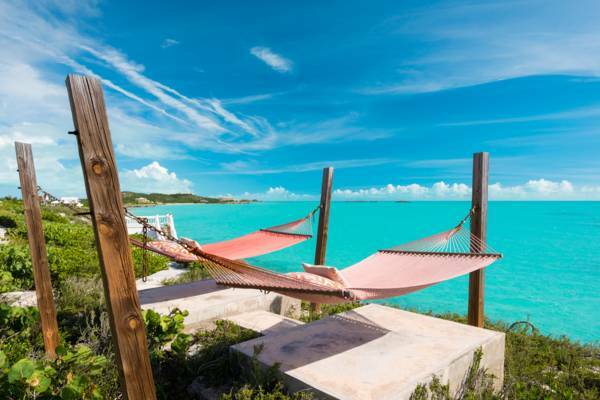 If you prefer, you can relax on one of the recliners or large hammocks. 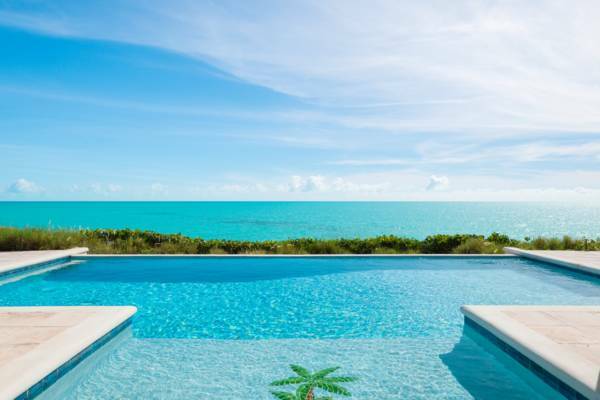 The sparkling pool blends with the brilliant blue Turks & Caicos water to create a stunning vista. At the shorefront is a dock with stairs leading right into the ocean. 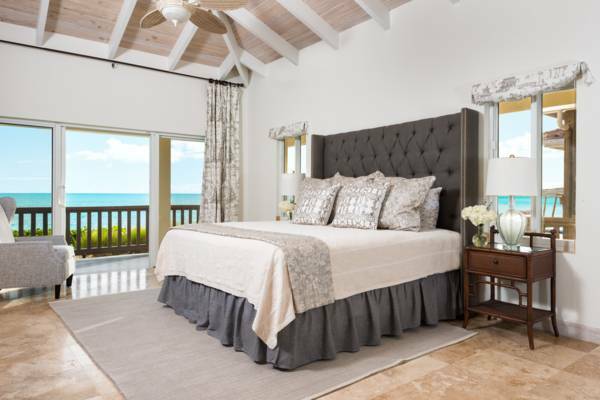 The four en-suite bedrooms can accommodate up to eight guests. 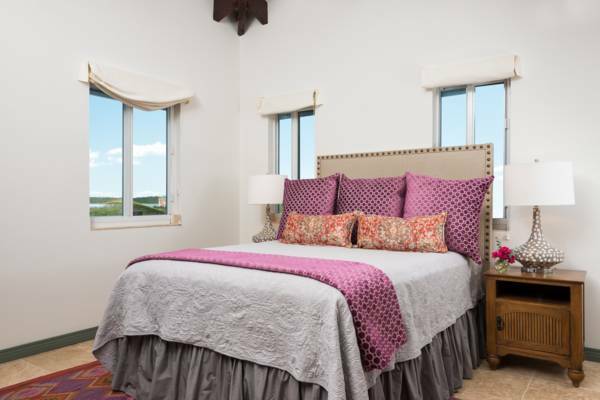 Inside the main house is a king-size bedroom with pool patio access, along with queen and twin-size rooms. 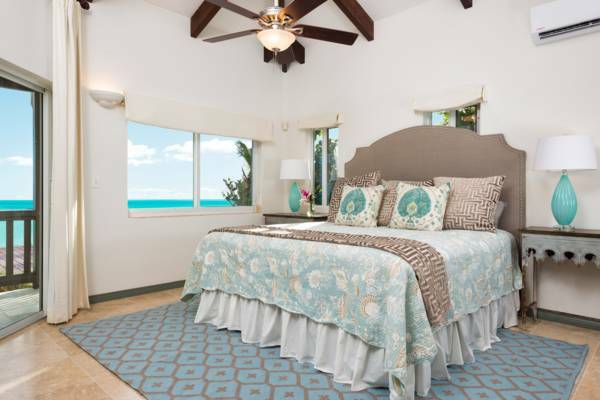 In the nearby guest cottage, is a king-size bedroom, Jacuzzi tub, and gazebo. 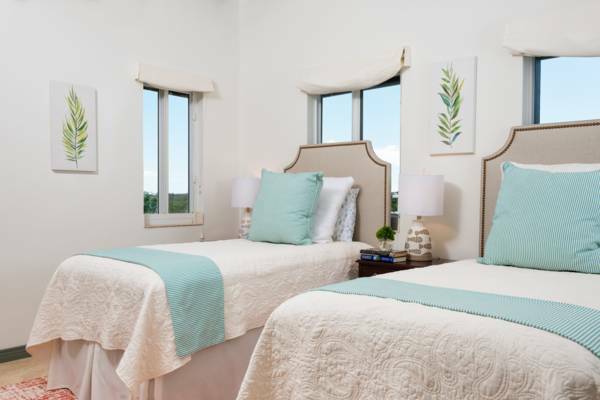 You’ll sleep in cool comfort with ceiling fans and air conditioning. Don’t worry about staying connected and entertained. There’s fast Wi-Fi, a DVD player, and televisions. Be sure to take the complementary 2-person kayak and glide out onto the ocean. You can paddle to a small sunken wreck close to shore and even take snorkeling gear to explore it underwater. If you’re looking to see a large variety of sea life such as queen angel fish, yellowtail snappers, and spiny lobsters, Smith’s Reef snorkeling site is a 10 minute drive away. 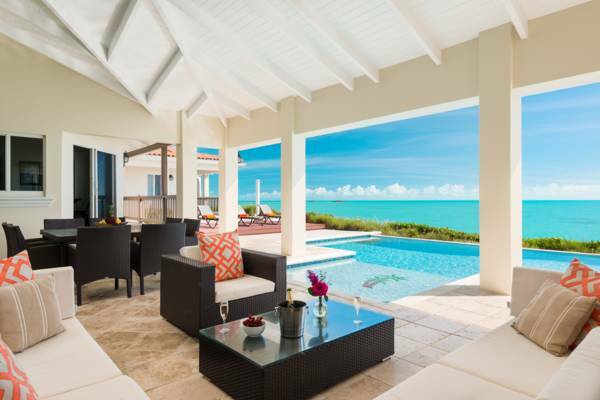 Grace Bay is just 14 minutes by car. 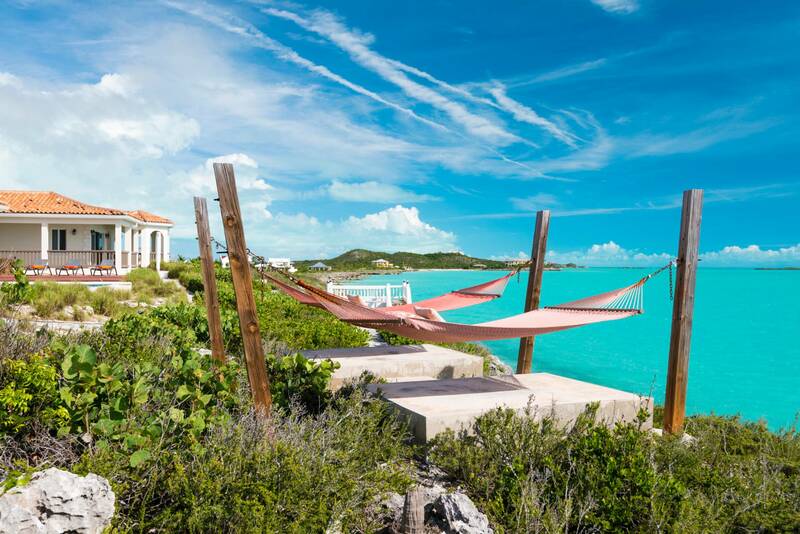 Grab one of the villa’s beach towels, and in no time at all, you can be soaking up the sun on world famous Grace Bay Beach. This villa was absolutely perfect for our family! The huge shaded outdoor space was wonderful for socializing, dining and taking in the glorious view! The fact that part of the pool is shaded under the roof made it perfect for our one year old grandson to play in -- and grandma too! Still lots of space for that glorious sun with plenty of lounge chairs, hammock, kayak, and easy access to the ocean. The deserted beach 1/4 mile away is also a great feature. The easy access to the Grace Bay area and the IGA grocery store was a lifesaver for us! 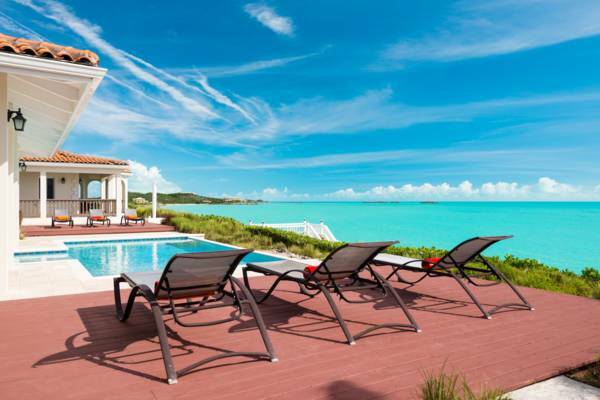 This villa is paradise and equipped beautifully! We will be back! !